Hurry up! The show'll start in 5 mins! I had never watched the Animal Show, which made me a real pathetic. Hubby watched once when he went to Madrid Zoo and he said it was awesome (yeah2... he had more fun than me when we were in Madrid, because I was cooped up in some boring conference while he went exploring the city). Phew, Made it on time! The show started with a flock of birds flying across the audience and already, I was as excited as a two-year-old toddler. 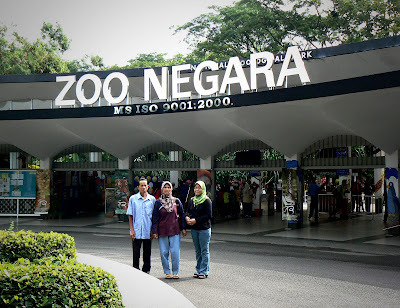 Suami Terchenta laughed at me and teased, 'So, who's more excited to visit the zoo, Dad or you?' Excuse me dear, but in case you hadn't notice, Dad happened to be excited as well. What would animal show be without the bright & funny seal? To be continued... the trip to Putrajaya.